Have any of you played in other bands? Well, I was in a band called Northstar in the 80’s in L.A., then went on in the mid 90’s to work with the Jon Dunmore Band (ex-Night Ranger) and the TV-Movie actor Richard Grieco (21 Jump Street-etc.) I was a member/ studio musician for these projects. I also had done studio work for Ruth Pointer (Pointer Sisters)- in the early 80’s, a project that never got released and later did some work with american singer-songwriter Mark Pont in the mid 90’s on his CD „Flying“ and also recently (2018) for the legendary Hollywood band „London“ with Nadir D’Priest, a CD called „Call That Girl“. I was also in Trance (the German metal band) for 2 years. from 2016 to 2018 and did a couple of tours with them. How is it that you started playing music? My mom was very music enthusiastic and wanted me to play an instrument, one day when I was about 3 yrs. old she told me to come watch TV with her and that there was a great new band called the Beatles the are going to be playing on the Ed Sullivan Show that day. I saw this and I immediately connected with the vibe and the music touched me spiritually and I knew this was what I wanted to do. Have you had other previous members? Yes, I’ve had some distinguished members in one or the other incarnations of the Eddie St.James Band. I’ve had the singer Stef Fontaine (ex-Uriah Heep) and Marc Droubay, drummer (Survivor) in my band at one time. Did you make music even when you were young? I had started to mess with the guitar at around age 8, my cousin showed me the intro to „Smoke On The Water“- (Deep Purple) but actually started to be more serious at 15. Then I started to play with other beginner musician in my neighborhood, This progressed rather quickly from there, just 5 years later I was already rehearsing / showcasing in Hollywood for the producer for the Ruth Pointer solo album. In the very next room to us were the Pointer Sisters and band rehearsing and also hanging out at that time were members of Earth Wind and Fire (Roland Bautista and songwriter B. Lloyd Taylor) and people from the „Los Lobotomys“- Band (Steve Lukather, Simon Phillips, John Pena). When they where on a break, they would all come into our room and watch us rehearse- that was very nerve wracking for me to have all these world famous top notch musicians watching everything I was playing. They were all very nice and gave the band and myself very generous compliments. Where are you from? I am originally from Los Angeles / Hollywood, California, despite all my success and contacts-etc., I decided to move over to Europe in 1996 to try it from a new and different angel. What year did the band form? My solo project / band was officially born with my first solo album, supported by Capitol Records, in 1989. What's your style of genre? I like many different types of music, but I am most known for Rock-Hard Rock and Metal. Nowadays I still do my Eddie St.James solo project in the Hard Rock / Metal genre. I’m also starting work on a Blues project and a Brit Pop-rock project (Beatles / Oasis) but under a different band name- so not to confuse anybody and to keep the projects separated due to the big differences in style. What inspires you? Life in general, I hear music either complete and / or bits and pieces of it in my head all the time. I’m constantly thinking about it and I’m also a music teacher, I’m always writing, teaching or leaning songs- so my life is filled with music almost 24hrs a day. How often and where do you rehearse? When I’m working with a band, it’s usually 1x a week. Like I’ve previously mentioned I have the guitar or some other instrument in my hands almost every day, so I end up practicing alone in any case almost every day. I also make it point to learn or improve something on the guitar as often as possible. How have you developed since you started with the music? I started out just playing guitar and from there it become a necessity to be able to know and do as much as possible-also in terms of music theory and study. I got tired of always having to deal with singer problems, so that was the next thing that I started to do and it’s absolutely necessary when you play very often as a solo act. As a songwriter it’s also very helpful to be able to play other instruments, so I moved onto piano, then bass. Eventually I also realized that it would be better if I just did almost everything myself-except for drums, also in terms of recording, having my own studio, equipment and know-how. This has greatly improved my independence and freedom to do my music my way and not have to compromise as before. Do you have other interests of work outside the band? I found out that I like computers very much, not only for doing the music and internet but also how they work, how they are programed and also how to repair them. I like working on them and often have to, because there is always something that goes wrong with them, it doesn’t matter what type of system either- all computers are troublesome. Are you looking for a booking agency, and what are your thoughts around that? Yes, I’m always interested in talking to people in the industry to see what the possibilities are for any particular projects or events-etc. In order to do a tour properly without having to deal with everything yourself, which can be very exhausting. You will need to have connections to a decent booking agency (which is very difficult, especially when you wish to be involved with bigger names and venues) you will also need a tour manager who also has experience and the contacts to the booking people and bands. This is called having the vitamin „B“ advantage, which is having a personal -„business“ relationship with these people in order to even get them on the phone or to even get them talk to you. Are you looking for a label, and what are your thoughts around that? I’m also open to this, nowadays it’s not absolutely necessary anymore, because the whole industry and record label system and function has completely changed. I would only be interested if I did not have to deal with any, what is now called a „negative record deal“. This is where the „artist“ has to buy the first 30,000 copies of his own record and pay 30,000+ for an opening spot in front of a major Act that is also signed to the same label. This would be an absolute BS situation and that’s just the tip of the iceberg. In other words you get a deal and a bill for over a million $$$ in costs before you even do anything. The contracts now for up and coming artist are even worse than they were before the the advent of the computer / internet take-over. What are your songs about? I like to write songs about social issues, that was the main topic in my last solo-CD- „Streets Cry Freedom“. I try to stay away from love / relationship songs, because that’s the only topic that almost all other artist write about almost all of the time. It’s a subject that has just been really run through the ringer far too many times and this will probably never change. It’s either boy/girl has no girl/boy but wants one or boy/girl lost girl/boy or boy/girl is angry/sad at girl/boy for leaving and that’s what almost every song is about. Who does the composing and writes the lyrics? I do all of my own composing, lyrics and arranging for all of my projects. Do you start with the music or the lyrics? Sometimes I start with a lyric or guitar, other times I have a bass or piano line that I start with. Do you compose in a certain environment? Yes, I like working at home in my home studio. I’m also able to do it anywhere and on the spot, in rehearsal, in a recording studio or out on the road. Have you done any covers live? With my Eddie St.James Project- no, original music is the main focus with this band. I have of course done covers as a solo act or in a cover band situation. I like doing both, but for me the original material has far more worth and value at least in an aesthetic / artistic sense if not in a more practical financial sense. The difference between a musician that only covers in comparison to that of a musician that also or only writes original material is like comparing someone that paints by numbers to artist like DaVinci or Van Gogh. A cover musician works on providing a service (like a vendor) and an original musician works on a career, an individual sound, identity and has a far greater value in terms of real artistic relevance. What language do you sing in? Mainly in english although I can and do sing in german when I’m covering some german pop or rock music. I do have 1 original song that I sing in german but it is a specialized protest song (in the style of Rammstein) for the german market that I won’t be doing live. What are the least and most people to attend one of your gigs? I’ve had a show where only 1 person turned up- I (we) did the full show anyways, thankfully things like this have only happened once. I don’t really know what the most would be, I guess around 3 thousand + as the main support on part of the Great White Tour in 1986. For the past 10 years or so when I play solo in the summer at outdoor events, I’ve averaged between 500 - 800 + people, thats not too bad for a solo acoustic guy. What ages are most of your concert attendants? The ages vary from very young to much older, the average age is somewhere between 40-50. Do you always play the same songs live, or do you vary? It depends if I’m playing solo or with a band. Solo, I play a lot of different material- depending on the situation. If it’s a low profile event, I’ll do vocal jazz, ballades and oldies and if it’s party event then I’ll do „Acoustic Rock and Metal“. With the ESJ-Solo Proj. I would do just an 1.5 or 2 hour show and the set-list is of course limited to my previously released material. Do you have a regular place you play live often? I used to have quit a few regular gig places for my solo-acoustic show, I still have a few. I just recently started a duo project and this is currently being booked at this time. The ESJ- Project, I have put on hold for the time being, as I’ve shifted away from working in a full band format at this time. I got tired of having to deal with all the personality and scheduling conflicts. It’s a lot easier for me to either play as a solo 1 man (metal Band) with backing tracks or as a (cover) duo with backing tracks. In this way there’s no headaches with all the people that would have to involved and financially this is also a much more ideal situation. What was your first gig like? My first real gig (backyard party somewhere in L.A.) was very good, we were practiced organized and prepared and i was very satisfied with the results. What was your latest gig? My latest or last show (in a band format) was in the summer of 2018, metal festival in northern Germany with Loudness (Crazy Night). Have you had to cancel a gig? Yes, but only once or twice in my whole career, due to extreme illness. There have also been one or two times that I’ve had to go to the hospital emergency after a gig due to illness. Where have you played live this year? In 2019, I’ve had to postpone preforming live for the beginning of this year, as I’m involved with a couple studio projects that are demanding most of my time. Also at this time I’m working on and preparing to release 2 music books, one is a lesson / theory book for guitar players and the other is a guitar and learning to read music for children, both in english and german languages. Where do you plan to gig the coming year? So far I have not made any plans to do any major touring or shows, but plan on concentrating more on my studio work including my solo and duo projects. When did you start to sell merchandise, and what do you have for sale? As soon as I had a website, which is over 10 or 15 years ago. Right now I have my (1) CDs (2) signed picks. I will be adding T-Shirts, hats / beanies and a couple of other items very soon. It’s simply progress in motion, one cannot stop or change the way life is going to progress. You can only react and adjust to it. The computer age has naturally brought both disadvantages and also advantages with it. It’s okay for people to download music as long as the artist gets paid for it- this is still a very complicated matter, but it seems to be improving through all the recent updates and changes in laws regarding royalty payouts, copyrights and ownership are concerned. It would be sad if you could not hold the physical product in your hands, so that you can look at the art work, read the liner notes-etc. I personally still issue physical CD’s but in very limited numbers from 300 to 600 hundred units and then that’s it. How do you think the music industry have changed because of this? As I’ve already mentioned in a round about way before, the music industry (record companies) have become more of a music service provider in terms of the 3 major record companies that now also own all of the major download platforms Like Spotify-etc. record companies no longer sign and develop artist, now an artist must already be self sufficient and already have their product finished (recorded) polished, a massive fan base and ready for promotion and sale. Even the computer companies have gone away from making computers to mainly offering computer services and becoming more of a music and entertainment provider, i.e. Apple. You can’t update, fix or repair the newer computers anymore you can only exchange them under warranty or you have to buy another new one, forced consumerism. What do you think of my work? I’m not sure that I understand the question?, If you are referring to your blog work- I think it is very good work that you have done and I am glad that there are people like you around to help the bands to self promote and for offering more exposure for people like myself in this regard. How do you think and know that this interview will help you in the music business? It is always good to get exposure for your work and it helps to keep the artist and bands presence and relevance (regardless of what some people may think in terms of artistic value or opinions based on objectivity) in the forefront of some of the pertaining social media. This also naturally helps any artist to stay on the radar and discussion in that particular musical community. Do you have any role models or idols? Yes but not necessarily only in musical terms but more in general and more in a way of mutual solidarity, i.e. Martin Luther King, Mother Theresa, Carl Sagen, Desmond Tutu, Bono and everybody else who promotes humanness, benevolence, peace, human rights and liberty for all humans without attaching it to any political or religious philosophy or agenda. In terms of music it would be The Beatles and Paul McCartney is also very active in terms of promoting humanitarian issues including rights for all sentient beings or life. Why do you think that they exist? They exist out of need, to help and insure that the socially discarded and the destitute have a voice through a greater common concern. Is it easier to find inspiration from older bands, or bands that are more active today? For me yes, I’m an „Old School“ type of musician, the older bands or the old school have set the bar so high in terms of musicianship, songwriting-etc. Today many of the newer artist (and the record company people for that matter as well) that have come along seem to believe that music is just a type of vehicle or means for getting rich and famous very quickly and easily by creating superficial, throw-away entertainment for a very quick and fickle demographic. For this segment it’s just a matter of being young and cute or just dancing and lip-synching and „writing“ simple or novelty none-sense, almost like children’s music for the under 30 market and then trying to pass it off as being something new and innovative musically. Of course this does not pertain to 100% of the newer artist (mostly in the top 40 and Pop genres) but to great deal. It seems like the more „modern“ music in general, especially the more rock oriented bands are going to have to rediscover the „musical wheel“ before they can start to claim that they are reinventing it. What advice would you give other bands or artists? It’s a very hard business, you have to be both and artist and a business person and treat yourself as such if you want to have any possibility of sustaining yourself as a full-time professional musician. How do you get psyched for a gig? Since I’ve been at it for a long time, there is no problem with anxiety or nervousness. I love what I do and I have fun doing it and the only thing that I always keep in mind no matter what, is that I own the audience- they do not own me. You have to shove it in their faces and own it or else if they smell fear or uncertainty, they’ll be unforgiving. After you know this, you don’t have to think about it anymore, you just go out and do your thing. Do you have any new material? 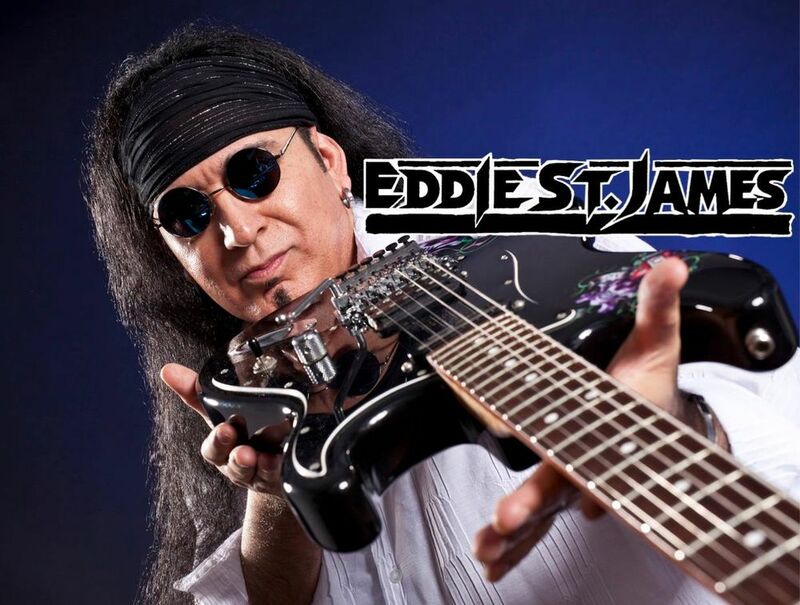 Oh yes, I have a new Eddie St.James CD in the work right now, called „Generation Radioactive“ due out this year-soon and it is a hard and heavy disc with 10 hard hitting numbers. I’ll be sure to send you a copy for review. or on my Website (www.eddie-st-james.com/home-en/contact/ ) under contact. What are your plans for the future? They are very simple actually, I plan to keep busy musically. I’m not to crazy about going on anymore long tours or working in a band situation anymore because of the physical and mental stress that it causes me. I hate having to try and sleep on a moving tour bus, it’s like trying to sleep through a continuous major earthquake, I get up and I’m already exhausted. I would like to continue working on recording new material for both myself or in collaboration with other bands or musicians. I also would like to continue working on writing one or 2 more guitar-theory books, also continuing my music school and working as a solo (both as solo-acoustic and / or as a 1 man Rock/Metal band) or duo act. I would still be open to working with a band IF (1) there is peace and mutual respect (2) it is well organized (3) there is some amount of compensation (4) tours not longer than 2 weeks at a time. On top of all this I’m planning this year in 2019 to go to London and take my music doctors diploma test, in any case I still have a lot of work musically in front of me.